Is there anything cuter than a puppy or dog? Yes: A sleepy dog that really just needs a nap. 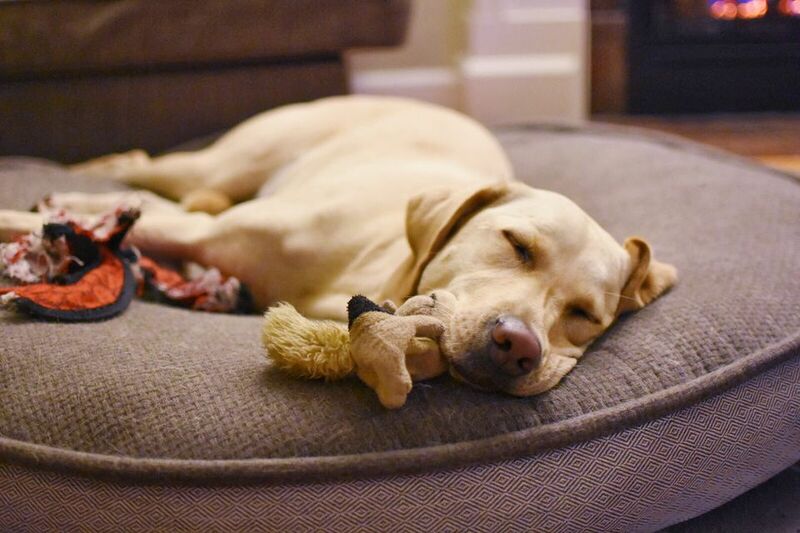 Whether their sleepiness strikes during playtime, mealtime or just hang time, there’s no question: Dogs are really, really good at sleeping and look really cute doing it. First: How Much Sleep Do Dogs Really Need? Before we dive into the doggos, it’s important to note that the amount of sleep dogs actually need varies by age and from breed to breed. Puppies, for example, may sleep a whopping 18 to 19 hours for every 24 hours—which provides plenty of opportunities to snap an adorable #sleepypuppy picture. Larger breeds of dogs, like Greyhounds or Great Danes, are lower-energy and require a lot of sleep, too. High-energy breeds, like Labrador Retrievers and Pomeranians, don’t need to doze the day away. 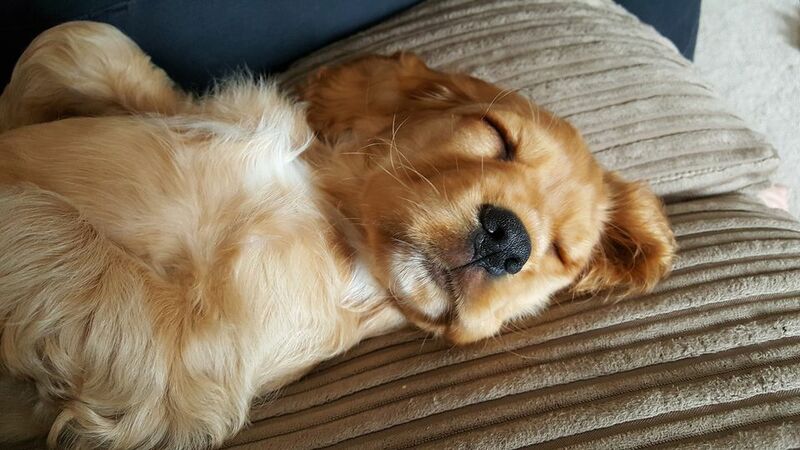 Not sure if your pupper is catching enough zzz’s? Make some simple bedtime modifications to prompt your pet to sleep, and then talk to your veterinarian about what’s normal for her breed, age, activity level and size. Do you ever just sit on the edge of your bed, wrapped in a blanket, and wonder if going to work is really worth it? No, no, neither does Chase and neither do we. Some studies suggest that taking a quick afternoon nap can boost productivity and increase focus. But what if you don’t have a comfy spot to catch a few zzz’s? Follow Winnie’s lead and use your brother or sister—or even your cubicle mate, if you're desperate. Prepping for houseguests is so tiring. Daisy has been doing laundry all weekend in anticipation of her parents’ arrival and just needs about, 20 minutes to close her eyes. Playtime was just sooo much fun and so exhausting, Petey can’t even put his toys away. Help a puppy out and clean up, would you? Roger is an accomplished hiker who loves to get out into the fresh air on the weekends, but needs to take pretty frequent breaks. His little legs can only carry him so far, after all. Sasha has been up writing the final paper in her "post-dogtoral" degree all night. Sometimes she wonders if she even really wants her Ph.D. anymore. Max has made some serious personal discoveries this year. His biggest accomplishment? Realizing that napping with the kitty was far more rewarding than fighting with the kitty. Our world leaders could learn a thing or two from Max. Riley really prefers to have his own space when he sleeps, but knows that good boys often put the needs of others before their own needs. Good boy, Riley—you’ll get that shut-eye eventually. You know when you eat too much on Thanksgiving or Christmas or just a random Wednesday and have to take a long nap to recover from your feast? So does Penny. That feeling when you wake up from a nap still tired, super dehydrated and unsure of what year it is. Go back to sleep, Conan. Sammy has perfected the art of pretending to be asleep when his mom comes in to wake him up for church. Take note, pups—this is what a serious, I-can’t-wake-him-up-because-he’s-a-growing-boy snooze looks like. Have you ever been so tired you fell asleep in a super weird (and uncomfortable) spot? Milo feels you—he was so tired, he fell asleep in one of his mom’s decorative baskets. It normally holds decorative seashells. “It’s not Monday. It’s not Monday. It is not Monday. How is it possible to be so sleepy before the week even begins?” wonders Peg the Pug.